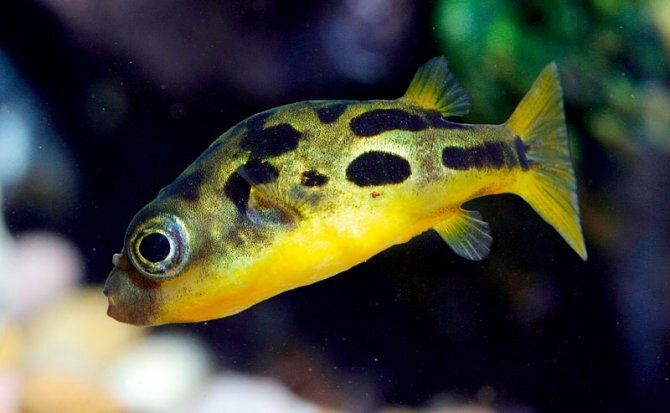 Although popular oddballs, dwarf puffers are finicky about diet and maintenance. They arenâ€™t community fish either, so set up an exclusive tank if you want some, warns Dr Neale Monks. Dwarf puffers belong to the genus Carinotetraodon, along with at least four other species. Males have ridges along their backs and bellies that can be raised when displaying or threatening rivals. Four species are traded fairly frequently and there are in fact two dwarf puffer species — Carinotetraodon travancoricus and C. imitator. Both are barely 2.5cm/1” when mature and distinguishing between the two is difficult. 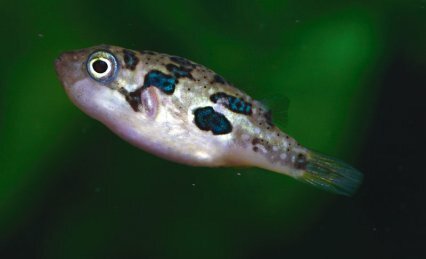 Many exporters seem not to bother, so that dwarf puffers sold in aquarium shops may be either species, or a mixture of both. Females and juveniles of both species are essentially identical, being golden brown with metallic reddish-brown speckles and blotches. Mature males of both have the keel, revealed by a dark band running along the belly of the fish. The blotches on the flanks are generally bigger and arranged in longitudinal bands. At least some males have iridescent wrinkles behind their eyes. As for distinguishing between male Carinotetraodon travancoricus and male C. imitator, there seem no consistent methods. Complicating matters further is the variety of C. travancoricus traded as the Blue-spotted dwarf puffer. It’s essentially the same as the standard form, but with iridescent blue-green blotches rather than reddish-brown ones. Dwarf puffers are endemic to the Kerala region of India and found in lakes and slow-moving rivers with plenty of submerged vegetation, leaf litter and sunken wood. Their irregular markings provide excellent camouflage and, when viewed from above, are difficult to spot — so helping them avoid predators such as herons. Water chemistry is variable; from soft and slightly acidic in some places through to harder and more alkaline conditions in others. While dwarf puffers are essentially freshwater fish, in at least some parts of their range, for example the Vembanad wetlands, the water may be slightly brackish. Alongside these fish can be found a variety of others, some familiar, others less so. 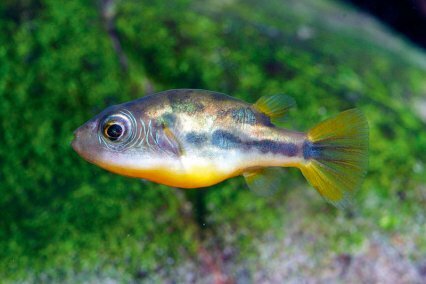 Typical constituents of the regional fish fauna include various barbs, danios and rasboras, halfbeaks, and predatory species such as glassfish (Parambassis spp.) and leaf fish (Pristolepis marginata). One of the relatively few Asian cichlids is from this part of the world too — the rarely traded but beautiful Canara pearlspot (Etroplus canarensis). While dwarf puffers are easily maintained in groups, they need space and hiding places. Males defend territories and look after the young, so they tend to be the most aggressive. Use rocks and bogwood to create caves and then scatter plants about to break up each fish’s line of sight. With dwarf puffers, it’s very much a case of ‘out of sight, out of mind’ when it comes to territorial aggression. In terms of stocking density, a good rule of thumb is to allow about 10 l/2.5 gal per puffer. When first introduced to their new home, dwarf puffers tend to be rather shy. Keeping the lights low will help them settle in quickly and usually by the following day they are actively scooting about looking for food and establishing territories. Eventually they will become very bold, eagerly swimming to the front of the tank when they see their keeper. Dwarf puffers will not eat flake or pellets and generally have little interest in freeze dried foods, but a variety of live and frozen foods are readily taken, so feeding these fish usually poses no problem. Among enjoyed live foods are small pond snails, Daphnia, earthworms, mosquito larvae and midge larvae. Live brineshrimp are readily consumed but, since these have little nutritional value, should be merely occasional treats. Almost any small, meaty frozen food will be accepted. Bloodworms, glassworms, black mosquito larvae and krill all make good staples.Occasional morsels of chopped seafood such as squid and mussel can augment the diet which should be varied to avoid problems with vitamin deficiency. Dwarf puffers are skilled panhandlers, quickly learning to train their owners to feed them on demand! Feed them small amounts, two or three times per day, so they have gently rounded but not swollen abdomens. Remove uneaten food quickly to avoid problems with water quality. Water quality needs to be excellent. Ammonia and nitrite levels simply have to be zero and the nitrate level should be as low as possible — certainly under 50 mg/l and ideally less than 20. To ensure good water quality, filtration should be between four and six times the volume of the tank in turnover per hour. Some stories describe dead dwarf puffers being found inside filters, but whether they were sucked in post mortem or while alive is open to conjecture. In any case, don’t use an excessively powerful filter and make sure the inlet is protected with a reasonably fine grille. Managing nitrate involves minimising the food that goes into the tank while maximising the amount of water that comes out. Depending on stocking density, water changes of 25-50% per week are recommended. By contrast, water chemistry isn’t a major issue and dwarf puffers adapt well to a broad range of conditions — provided extremes are avoided. Ideal conditions would be around pH 7.5, 10ËšdH for general maintenance, though somewhat softer conditions may be required for spawning. There’s no need to add salt to the water, despite being occasionally suggested in the past. A water temperature between 25-28ËšC/77-82ËšF suits dwarf puffers well and these fish cannot be kept in unheated tanks. Dwarf puffers can be kept in systems as small as 45 l/10 gal without undue difficulty, but smaller aquaria are not recommended because of consequent problems with water quality and pH stability. Very small tanks often have inadequate filtration systems and dwarf puffers will not tolerate elevated levels of ammonia or nitrite for long. Small tanks also experience bigger pH drops between water changes than bigger tanks and, while adaptable, these puffers do not like rapid pH changes any more than other tropical fish. So while some people recommend tiny nano tanks for dwarf puffers, I feel these fish are best reserved for systems 45 l/ 10 gal or larger. Bright lighting is neither required nor appreciated, so it generally makes sense to choose plants that do not need high levels of light. Java moss, Java fern, Anubias, and hardy species of Cryptocoryne such as C. wendtii are recommended. Fast-growing floating plants such as Limnobium laevigatum are also useful to provide shade and cover while helping to remove nitrate. Wild pufferfish spend much of their time exploring by hovering over solid surfaces rather than cruising about in midwater. Their slow, deliberate mode of swimming is adapted to this, allowing them to investigate every square inch of the plants, rocks and sunken wood around them. Provide your puffers with such opportunities. It doesn’t really matter how you do this and your puffers will be as happy to explore the floating roots of Limnobium laevigatum as they will a plastic mermaid or clump of Java moss. Surprisingly perhaps, these fish are able to jump when alarmed and shouldn’t be kept in an open-topped aquarium. Dwarf puffers have occasionally been bred in home aquaria. Because of problems distinguishing the two species, it isn’t clear which reports belong to Carinotetraodon travancoricus and which to C. imitator, but in all probability their breeding behaviours are identical. Indeed, the overall process is very similar to other Carinotetraodon species as well. Sexually mature males can be distinguished by their brighter colours and mature females ready to spawn will become noticeably rounded as they fill up with eggs. Males secure territories among feathery plants with Java moss and willow moss (Fontinalis spp.) particularly well favoured. A male attracts a female by raising his keel and engaging in fluttering dance routines. Spawning is very boisterous with the eggs being scattered into the moss. He then quickly chases the female away and assumes total responsibility for broodcare. The eggs hatch after about five days, but the fry don’t start swimming for at least another week. Once that happens the male loses interest and he should be removed. The free-swimming fry will now need to be fed tiny live foods such as microworms and Cyclops nauplii. Growth is fairly rapid and the fry will be 1cm/0.4” or so after two months. Spawning occurs readily if dwarf puffers are given the right conditions, namely lots of live food, slightly soft and acidic water conditions (pH 6.5-7, 5-10ËšdH) and suitable spawning sites. The tricky part is rearing the eggs and fry, as the eggs are prone to fungal infections, particularly in hard water. The tank needs to be spotlessly clean and the aquarist should use a pipette to extract uneaten food and faeces. There are no good reasons for keeping tank mates with dwarf puffers. The idea that they need a ‘clean-up crew’ is particularly misleading. It’s your job to keep the tank clean! Catfish, snails and shrimps are all redundant in a well-maintained pufferfish aquarium — and adding other livestock will only increase the rate at which nitrate will accumulate, compromising water quality and making your fish more prone to disease. Carinotetraodon spp. also tend to be fin nippers and dwarf puffers are certainly no exception. They cannot be combined with any of the standard community fish, showing a particular liking for the fins of some slow-moving species such as angels, gouramis, livebearers and Corydoras. The dwarf Suckermouth catfish of the genus Otocinclus have been widely recommended as good companions. At one level it is fair to say that dwarf puffers and Otocinclus catfish get along reasonably well. 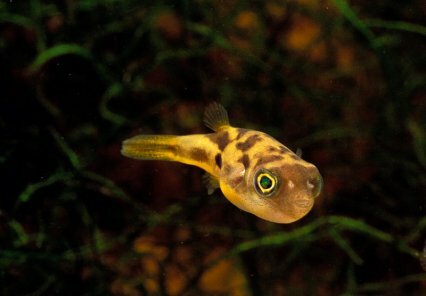 Dwarf puffers may sometimes nip at them, but these catfish are fast swimmers and quickly learn to avoid trouble. However, Otocinclus aren’t especially easy fish to keep. Their mortality level immediately after import is high — being prone to starvation and sensitive to poor water quality. Otocinclus feed almost entirely on green algae and aufwuchs in the wild, so it’s important they have an adequate diet. Algae wafers are a good staple food, augmented with extras like squashed tinned peas and thinly sliced cucumber. These are of no use as scavengers and won’t eat the types of algae that grow in dimly lit tanks, such as diatoms and hair algae. They are schooling fish that must be kept in groups of at least six specimens and, being particularly active swimmers needing lots of oxygen, this scenario practically demands a tank upwards of 90 l/20 gal for them. Small algae-eating shrimps such as Amano and Cherry can make a better choice, but bear in mind that in their smaller sizes these are simply pufferfish food! Baby Cherry shrimps, for example, will be eaten by dwarf puffers without any hesitation and, even when fully grown, the smaller species like Bumblebee shrimps will continue to be at risk. Dwarf puffers are best kept in groups of their own kind, but that’s not really a problem because they’re such entertaining animals. Maintained properly, dwarf puffers are endearing little fish that amply justify the expense of an aquarium just for them. Four other Carinotetraodon are currently recognised. 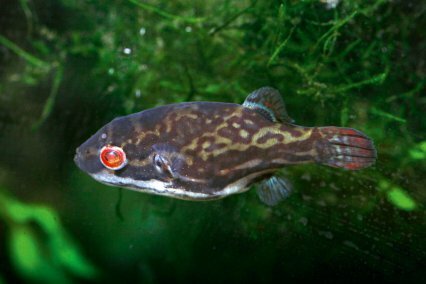 The Red-eye puffer, C. lorteti (above), has been around for decades but, because both sexes tend to be snappy towards one another as well as other fish, it’s never been that popular. Still, if you’re prepared to keep it in its own aquarium, it’s fun and attractive. Male C. lorteti are lovely fish; greenish-brown above and cream below, and with mustard yellow stripes and an orange keel. The tail fin is metallic blue-green with white around the edges. Females are mottled brown above, plain white below. As their name suggests, both sexes have red eyes. Maximum length is about 5cm/2”. The Red-tailed red eye puffer, C. irrubesco, has less brilliant colours than those of C. lorteti, but is a milder species that works much better in groups. Males are chocolate brown above, cream below, and have red tails. The banding on the top of the body is cream and the keel orange. Females are similar to those of C. lorteti, but the belly is not plain white, instead bearing numerous brown squiggles. The beautiful Striped red-eye puffer (C. salivator) is only rarely traded. Males are mottled brown with an orange belly, orange tail, and a vivid red keel, and can also display a striking pattern of oblique and vertical bands across the head and flanks. Females are much like female C. irrubesco, except that instead of brown squiggles on the belly they have longitudinal stripes. Note that C. salivator is a snappy, unsociable species that needs space and lots of hiding places if kept in a group. Maximum length appears to be well over 6.5cm/2.5”. The Bornean red-eye puffer (C. borneensis) is not traded that much, probably because it has temperament issues. It resembles C. lorteti but, on the few occasions it has been kept, has turned out to be substantially more snappy and aggressive.